I know it seems like I sew things. I mean, I do sew things. But I would never call myself a seamstress. What I do, you can do too, I promise. 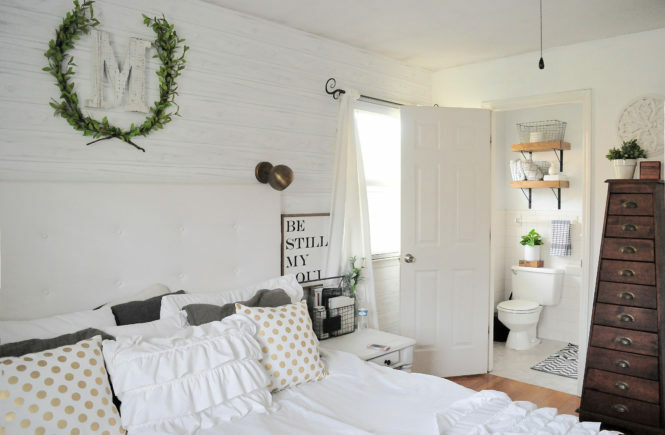 Can you sew in a straight line? Wait. No, me neither. Ha! See? That’s not even required. Let’s just sew in a basically straight direction and we’ll get there. We had several mismatched stockings for Christmas and really none for the two additional members of our growing family. We had two sets for us as a couple and used one set for the kids last year. Lame! It worked and all, but it’s time to class up our Christmas decor game. 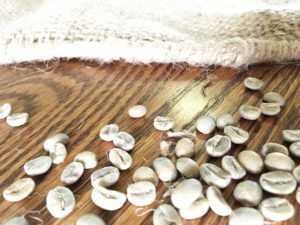 When we visited Nate’s Coffee roastery this past summer, he mentioned the burlap sacks the coffee beans come in. Step 1: Trace your stocking. This is pretty simple. 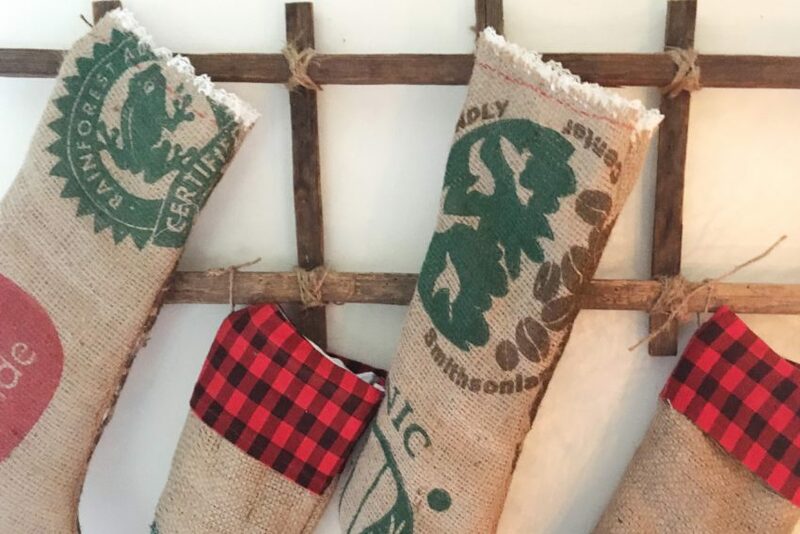 Just lay out your burlap, folded in half, and take a stocking you already have to use as a stencil. 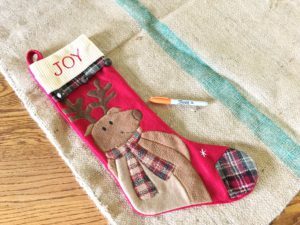 Trace around the stocking using a marker. Step 2: Cut out your stockings! 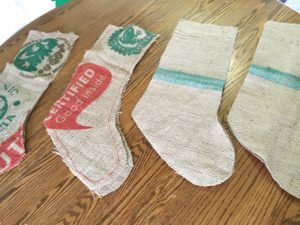 Ok, since you folded your burlap in half, you can cut both sides of the stocking out at once. Timesaver! I cut about a half inch outside of the drawn line from tracing. I also traced fairly generously around the edges of my stocking. You want to ensure there will be plenty of room for sewing, without losing too much room in your stocking. You can always trim off the extra fabric once you’ve sewn it up. You should end up with two identical pieces. This part is slightly tedious, but not too bad. 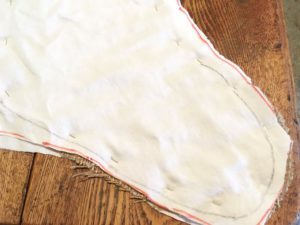 Just lay your two stocking pieces together, marker side out (so that the marker ends up on the inside after sewing and turning right side out) and line them up as best you can. Place your straight pins along the perimeter of the stocking to ensure the pieces don’t slide around. 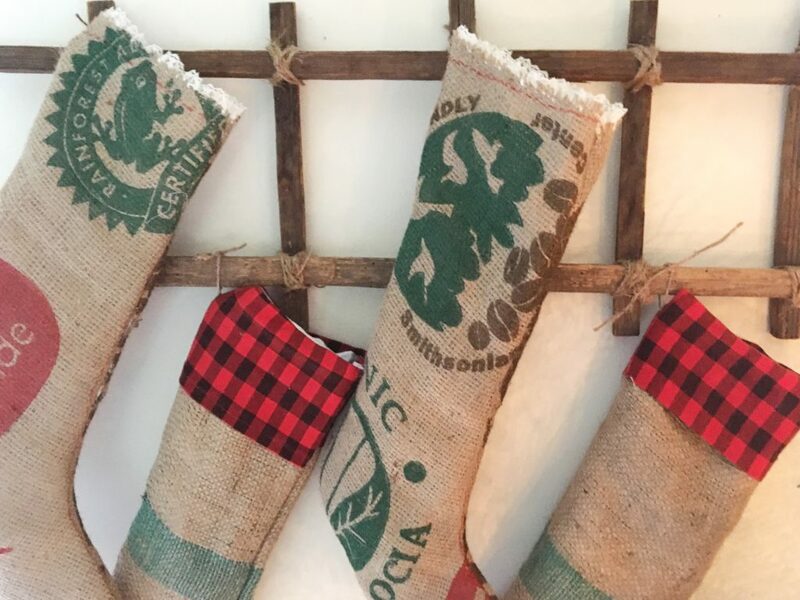 If your burlap is fairly loose, you may want a lining to keep any stocking stuffers from poking holes through. 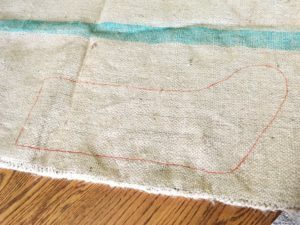 I used an old white bed sheet, folded over and traced same as the burlap. Then I laid the white lining pieces on the outside of the burlap when pinning. So I had four layers to sew through. I worried it might be too thick for the sewing machine, but it handled it just fine. I also put a plaid cuff on the top of the boys’ stockings. I just pinned it to the top of the white lining and sewed that part together first. It takes a little thinking through, but it’s also very simple. I had some lace lying around and added that to top of the girls’ stockings. 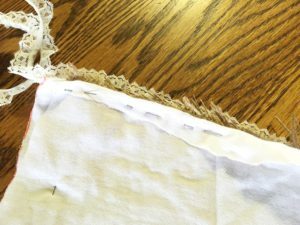 I pinned the lace to the top of both the lining and burlap (all three were pinned together along the top edge of each stocking piece). Then I sewed along the top of the stocking pieces before sewing the two stocking pieces together. Sewing time!! Thred that sewing machine (the trickiest part for me!!) and the bobbin thread (even worse!!) and now it’s easy peasy. The hardest part for me was the foot of the stocking. In order to make sure it’s rounded the way you want, you may want to draw a rounded line for yourself with your marker. 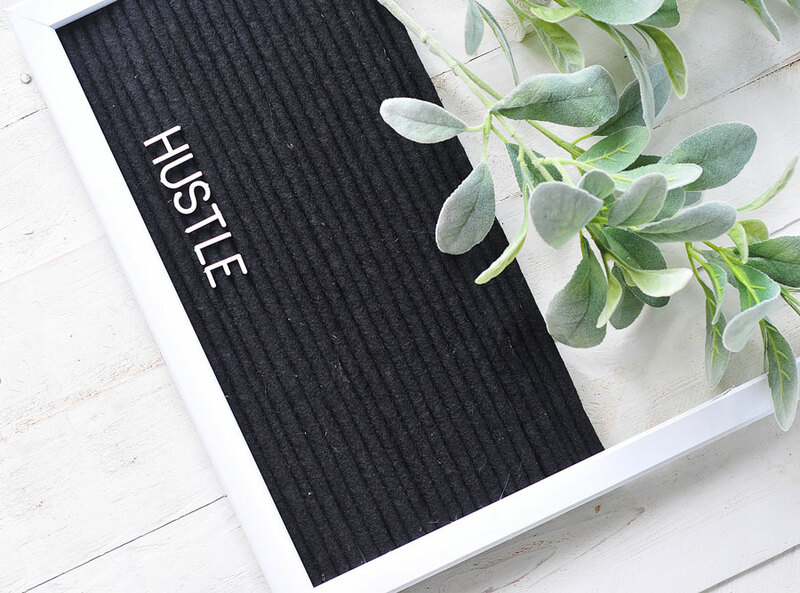 No one will see it in the end since it will be inside your stocking. Then when you get to the foot, just move slowly, rounding the fabric and following the guide you’ve drawn for yourself. 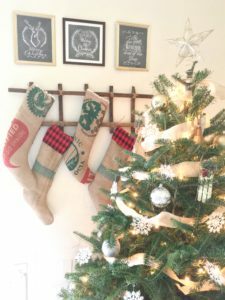 To Hang: Slip in a piece of ribbon or jute at the top corner of the stocking. Just fold it in half and stick the end through the two pieces of stocking (creating a loop). Then when you sew it up, the ribbon will be sewn into place, ready to hang the stocking. Once it’s all sewn together turn it right side out and make sure there are no holes. You may have to iron it flat to get it to hang correctly. All done! That wasn’t so bad was it? Time to hang them with care in hopes that Saint Nicholas soon will be there. Merry Christmas, Salt & Lifers! Go be the spice of life this holiday season.